"Named for a queen in India, these coconut cupcakes with curry lemon curd and a sweet basil cream topping will wow your friends and family. They have sweet but exotic flavors and a stunning presentation. The cupcakes take time to create, but the final product is worth it! The lemon curd and basil cream need time to chill, so they can be made the night before." To make the sweet basil cream, heat the whipping cream in a saucepan until hot; do not boil. Turn off the heat and add the basil, stems and all, to the cream and allow it to steep for 1 hour. Refrigerate the cream for 3 hours or overnight. Strain and discard the basil. Meanwhile, make the sweet curry lemon curd. Use a large microwave-safe bowl: the curd will expand to twice its volume as it cooks. Whisk together the white sugar, two eggs, and curry powder until smooth. Stir in the lemon juice, lemon zest, and butter. Cook in the microwave, stirring at one-minute intervals, until the mixture is thick enough to coat the back of a metal spoon. Pour the cooked curd through a sieve and refrigerate for at least three hours or until set. The mixture will have the consistency of soft pudding. Preheat an oven to 350 degrees F (175 degrees C). Line 24 muffin cups with cupcake liners. Scoop the cake batter into the prepared pans, filling the cups 2/3 full. Bake in the preheated oven until the edges are golden brown and a toothpick inserted into the center of a cupcake comes out clean, about 20 minutes. Cool completely. In a chilled bowl, whip the cold basil-infused cream and 3 cups of confectioners' sugar until stiff peaks form. Refrigerate. Beat the cream cheese and remaining 3 cups of confectioners' sugar until smooth and soft. Fold in the whipped cream and mix gently until fully combined. To decorate the cupcakes, spread a tablespoon of the lemon curd on top of each cupcake, followed by a dollop of the basil cream. Sprinkle with dragees. 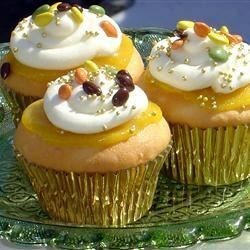 If available, gold dragees or brightly colored chocolate-covered sunflower seeds make beautiful decorations for these cupcakes. To make the lemon curd on a stovetop, combine the ingredients in a saucepan. Cook and stir over medium-low heat until the mixture thickens, about 15 minutes. Remove from heat, strain, and chill as directed. The best cupcakes I have ever had. Takes time but well worth the time. Do the lemon curd and basil cream the day before. So unusual and delicious. Very interesting flavor combinations.